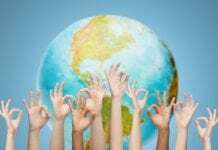 Home Uncategorized Articles Are Vaccines Safe and Effective? The most important question for most people is: are vaccines safe and effective? More and more, parents want to know if they if they are putting their child’s well-being at risk by vaccinating, and whether they will be protected as a result. Unfortunately, the hard evidence tells us that not all children who go through the vaccination process come out unharmed or protected. The evidence also tells us that vaccines are not always effective, and in many cases, they are not effective at all. 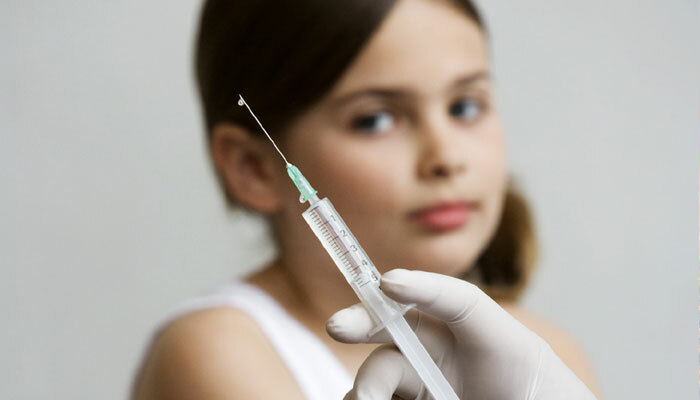 There is even compelling evidence linking vaccines to autism which we will discuss later in this series in part 9, but let’s take a look at vaccine safety and efficacy first. In 1986, pharmaceutical lobbying resulted in Congress passing the National Childhood Vaccine Injury Act. This created the Vaccine Injury Compensation Program, or VICP. Sometimes referred to as the ‘Vaccine Court’, VICP does not refer to a court with a jury, but is actually an administrative procedure that serves to protect the pharmaceutical industry from civil litigation based on injuries and deaths that result from vaccines. Whenever federal health officials determine that compensation is not due a family who petitions them for vaccine related injury or death, the case is heard by an administrator in US Claims Court. In 1988, the National Vaccine Injury Compensation Program was created as a result of the National Vaccine Injury Act. 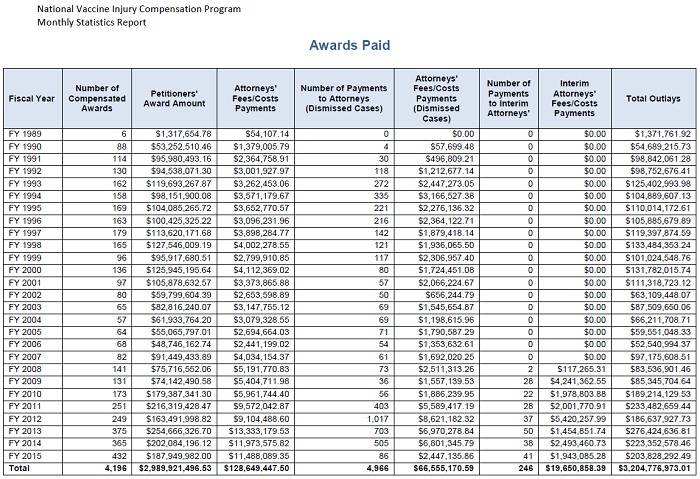 To date, more than $3 billion has been paid out to thousands of people for vaccine injuries. This huge amount is telling, as the system is specifically designed to make it difficult to win these awards. It also tells us that vaccines are obviously not as safe as we are led to believe. The most troubling part of the compensation program is that it completely absolves pharmaceutical companies of any legal recourse regarding vaccine products. We see how these companies have conducted themselves when faced with litigation, and now they are completely shielded and have the American taxpayers pick up the tab with nothing to motivate them to make vaccines that are safe and effective. Also, because there is no discovery process in the VICP, pharmaceutical companies do not have to disclose any damaging data with their product. Since January of 2014, twice as many victims have won compensation than the previous eight years combined. In these cases, the vaccine court ruled the evidence showed vaccines “more likely than not” caused the plaintiff’s injuries. Also on the rise is the number of vaccine injury cases the government has “conceded”: up 55 percent in a little over one year. However in March the federal government removed the latest vaccine injury court statistics—more than a year’s worth of data—from one of its publicly reported charts. You can review the HRSA’s ‘monthly statistics report’ on VCIP cases for yourself. You will be able to verify that this data is aggregate, versus a monthly report. Therefore, the government’s report is of no use in identifying current safety threats posed by any particular vaccine. 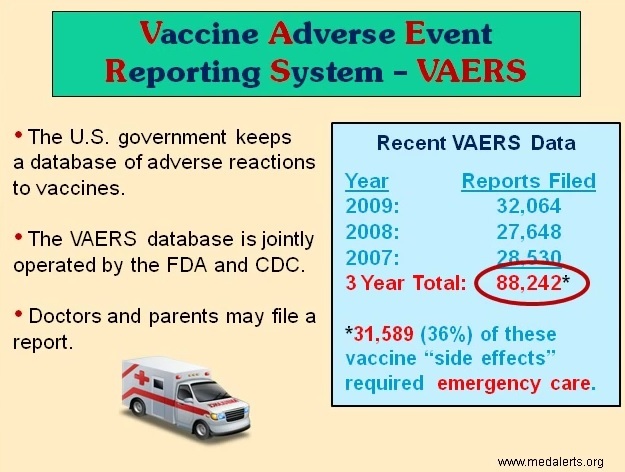 According to their website, VAERS receives around 30,000 adverse event reports annually with 13% classified as serious (e.g., associated with disability, hospitalization, life threatening illness or death). That works out to around 4,000 cases per year. What is not usually discussed, but is openly admitted by VAERS, is that because this is a self-reporting system and diagnosing adverse events can be very subjective, it is estimated that only 1-10% of all adverse reactions are ever reported to VAERS. Doctors have been conditioned to not connect a child’s subsequent maladies with vaccine visits, therefore the bulk of the cases go unreported. 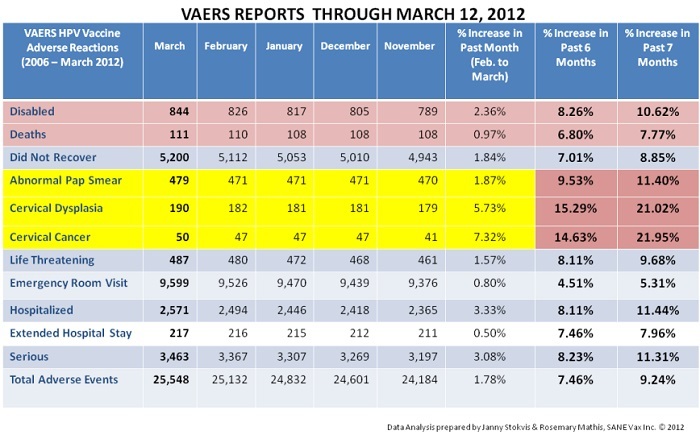 When we look at the trend in reported incidents, VAERS cases are rising steadily every year. So far, 2014 had the most reported cases of adverse events following vaccines, with a record 38,519 reports. While the exact number of cases may be debated, what the Vaccine Injury Compensation Program and VAERS clearly show us is that vaccines sometimes have life altering negative consequences. This is an inarguable fact. Once our government decided that pharmaceutical companies weren’t going to be responsible for the safety of the vaccines they manufacture, they had to create some kind of system for handling vaccine injuries. Our federal government had to create a multi-billion dollar Vaccine Injury Compensation trust fund to compensate vaccine injured children and set up a reporting system to track serious adverse vaccine reactions, up to and including death. 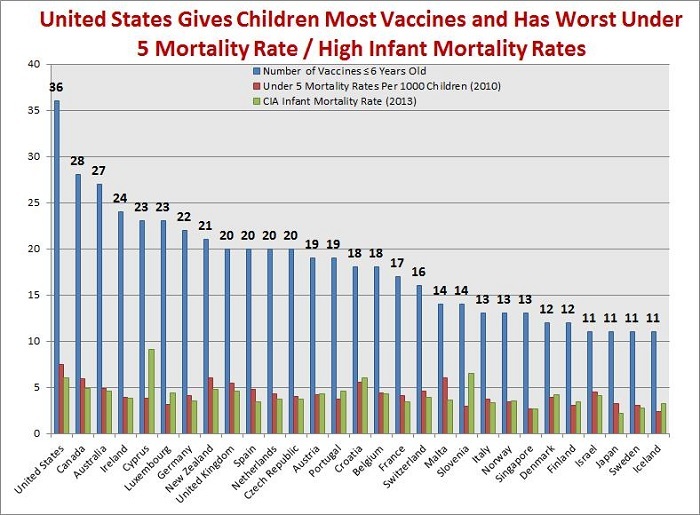 This shows that, without a doubt, vaccines are in fact NOT safe for everyone. In my opinion, what is forgotten in the debate, but could end up having the greatest impact on our children’s health, is that we have no idea about the long term safety of vaccines. There are no long term studies on this topic. Vaccine trials typically last for only 4-8 weeks and are simply not designed to determine long term vaccine health effects. 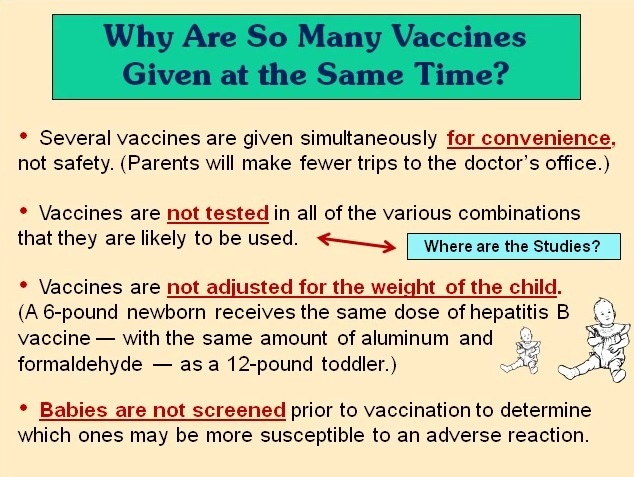 There have also been no studies performed on the combination of multiple vaccines typically given in one doctors visit. By design, these clinical trials test for effectiveness, not safety, and short or long term health effects are not even on the radar. Scientists are only looking to see if the vaccine creates the desired response that can produce antigens so the drug can obtain FDA approval. 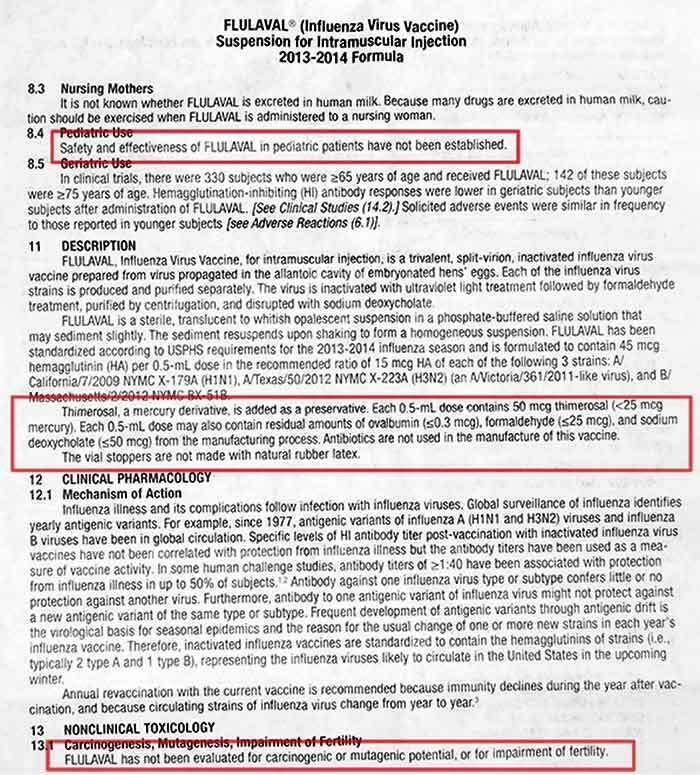 For example, look at the Flulaval (flu vaccine) package insert below. 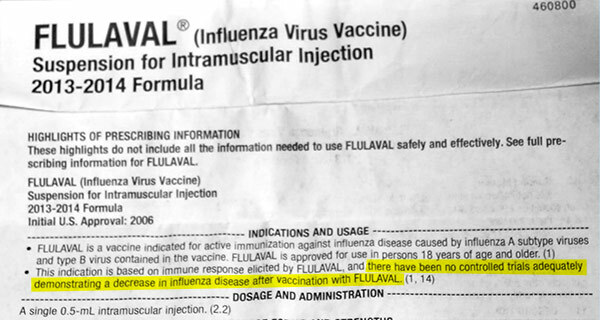 Outlined in red it clearly states ” Safety and effectiveness of Flulaval in pediatric patients have not been established.” You can also add pregnant women to that statement because there is no data showing safety for this population either, yet this vaccine is widely promoted for babies starting at 6 months and for pregnant women. Lest you think this particular package insert is an exception to the rule, you can visit this site to download the package insert from any number of vaccines. This site also contains a link to the current approved U.S. vaccine schedule. Reading every vaccine package insert in depth will certainly yield a great deal of information that contradicts the popular message about vaccine safety, but you don’t have to rely solely on them for your research. There are a number of highly credible experts in the field who have shared their own concerns about vaccine safety. If you’re interested in accessing more facts, quotes, opinions and graphics regarding the safety of vaccines, you can take a look at the compendium on this blog and follow any given citation wherever it may lead. 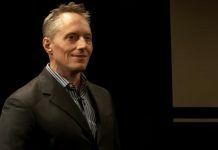 If you want to see what the body of research actually says about vaccine safety and effectiveness, you can pick up a copy Neil Z. Miller’s just published book, “Miller’s Review of Critical Vaccine Studies: 400 Important Scientific Papers Summarized for Parents and Researchers”, wherein he summarizes the results of 400 scientific studies on the topic. The HPV Vaccine is relatively new and was one of the vaccines that was fast tracked to market. 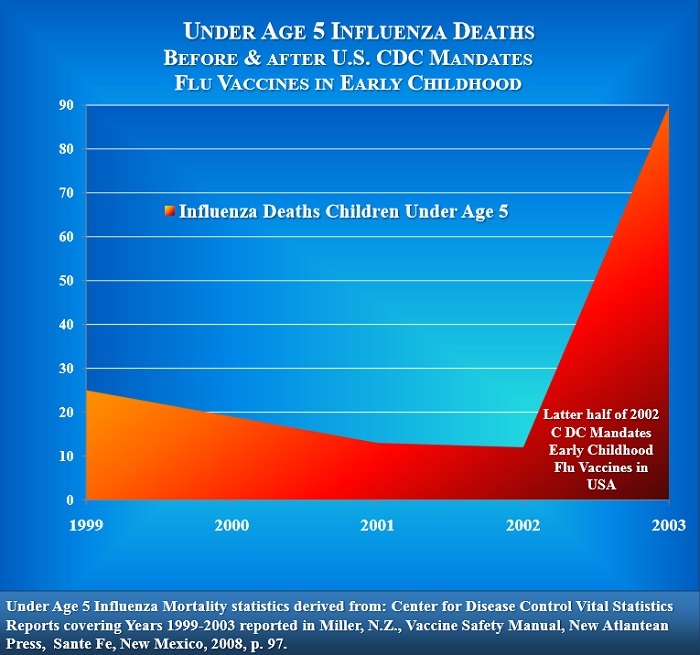 As you can see from the chart below, safety is not a real concern for vaccine makers. 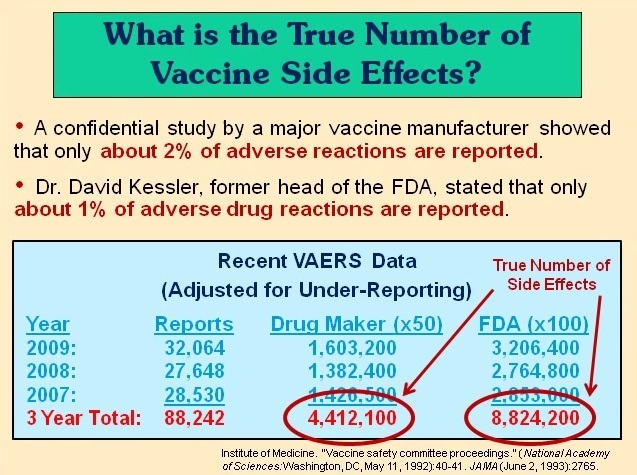 Keep in mind that VAERS only captures a fraction of adverse events, per the former head of the FDA, and this chart reflects adverse events following the administration of only one of the scheduled vaccines (HPV vaccine) during a 6-year period. For a more thorough discussion of the safety and effectiveness of the HPV vaccine, check out this short video. Is The Current Vaccination Schedule Safe? Up to 13 Vaccines in One Visit? 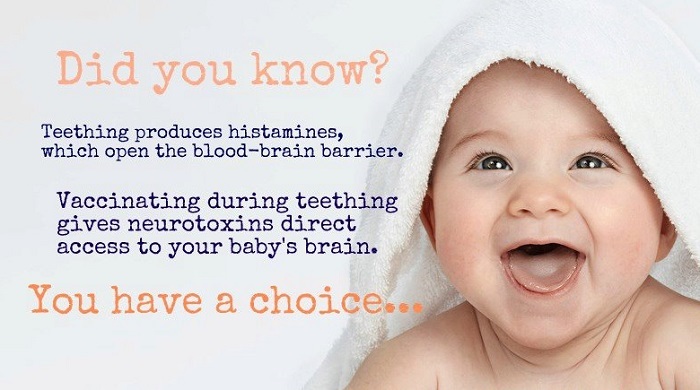 Why are we giving our children so many doses in one visit? We have seen some immediate deadly reactions with some children taking multiple vaccines. Some anecdotal evidence is this case where a doctor gave a 6 month old 13 doses in one visit and the baby died 5 days later. Another one-year-old died after six doses in one visit. A four month old baby died after receiving 7 vaccines in one visit. What are the consequences of so many shots at once, on an undeveloped immune system? The answer, again, is that we don’t know. There is no research on the safety of receiving multiple vaccinations in one visit, yet that policy is strongly promoted. I don’t want to sound like I’m nitpicking but we have thousands of children being vaccine-injured every year, as well as a whole host of autoimmune diseases and neurodevelopmental disorders manifesting in our children with increasing frequency. What could be the justification for our regulatory agencies failing to require this kind of research? 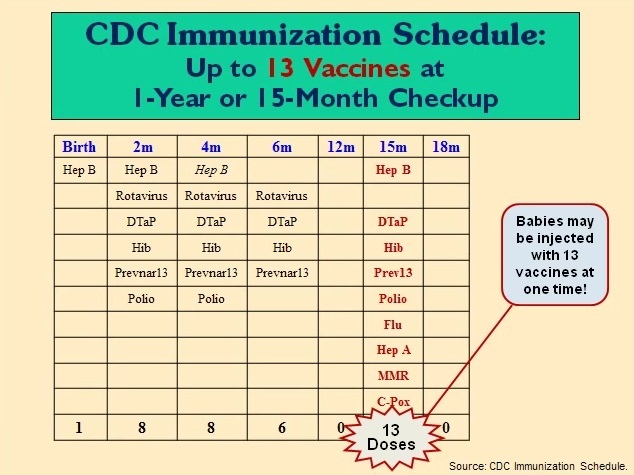 Isn’t it strange that the CDC would recommend 6 vaccines at once for a 2 month old infant without any proof whatsoever that 1) individual vaccines are safer for children than forgoing them and 2) all the recommended vaccines can be given safely in combination? Dr. Offit later backed down to 10,000 vaccines at once. How can Dr. Offit or any responsible person advocate such nonsense, in the absence of any studies to back up the safety of receiving even 3 shots at once? 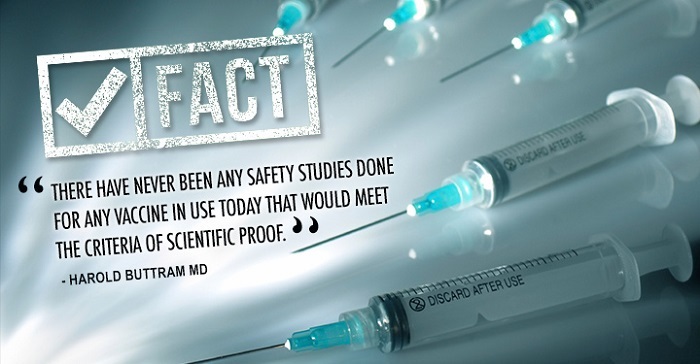 What Dr. Offit should have actually said is: ‘In my opinion, it is safe to take 100,000 or 10,000 vaccines at once.’ When vaccines are tested, they are only done one at a time. When administering 3, 6 or 10 vaccines at once, you are administering dozens of ingredients and chemicals that interact with one another and with the unique physiology of each recipient. 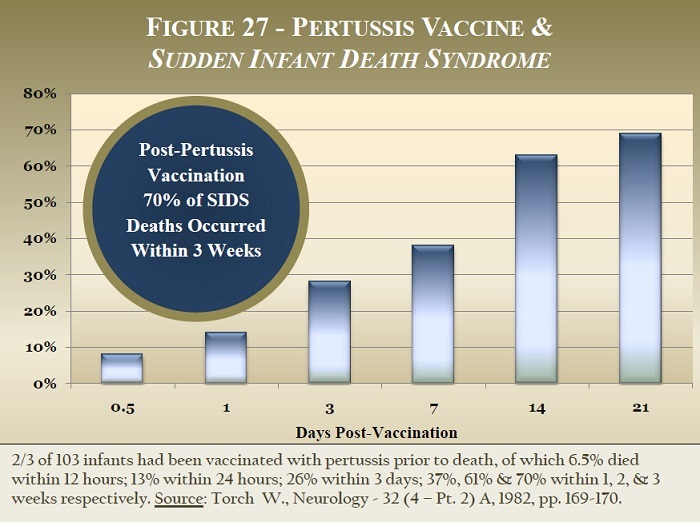 These SIDS deaths were significantly more than expected were there no association between DTP immunization and SIDS. Don’t be misled by the red herring (doctor’s visits) in this research. It sounds like the authors might have started out earnestly seeking an answer but by the time the study got published, someone thought it was a good idea to throw in another variable to muddy the waters. Of course, we already know that babies are scheduled for well child exams during the period of time when SIDS is most likely to occur. It would have been heartening to see a more thorough analysis of these findings to determine more precisely why babies who died of SIDS were more likely to have recently received a DTP vaccine. This is exactly what has happened with the publication of a new study in the Journal of Pediatrics titled ,“Adverse Events following Haemophilus influenzae Type b Vaccines in the Vaccine Adverse Event ReportingSystem, 1990-2013,” wherein CDC and FDA researchers identify 749 deaths linked to the administration of the Hib vaccine, 51% of which were sudden infant death linked to the administration of Hib vaccine. Despite the shocking findings outlined above, the conclusion reads: “Review of VAERS reports did not identify any new or unexpected safety concerns for Hib vaccines.” Odd, no? I’m no scientist, but I certainly have some safety concerns. At the very least, you might imagine the authors would have some recommendations for further study based on their findings. The findings should have been alarming, but the only thing that gets reported is the unsubstantiated conclusion. Not unlike many studies whose findings threaten the safe and effective message, this one was buried by publisher Elsevier, who charges outrageous prices to access it. Here’s another funny thing. The authors of this study work for CDC and the FDA, which is to say, organizations that are supposed to work for the American taxpayer. 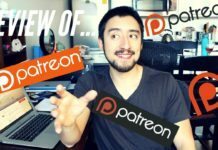 We funded the study, but we have to pay $30 to view it for 24 hours. There are many published articles that report on the injuries from vaccines but they are rarely publicized in the U.S. In the 1970s, about 300 victims and relatives of children who died after receiving vaccinations against smallpox and other diseases in Tokyo, Nagoya, Osaka and Fukuoka fought against the government and won compensation in the 1980s and ’90s. Japan introduced the MMR (measles, mumps and rubella) vaccine in 1989 but was forced to take it off the shelves four years later after about 2,000 people suffered side effects that included aseptic meningitis. These incidents led to a major revision of the Preventive Vaccination Law in 1994, with lawmakers deciding to recategorize vaccination from being mandatory to one that is routine and optional. The Japan Times article cites statistics compiled by the health ministry which reveal that 38 infants died after receiving the Haemophilus influenzae type B or streptococcus pneumoniae vaccines between 2011 and 2014. There were more than 2,000 complaints lodged as a result of side effects of the new HPV vaccine. Japan withdrew its recommendation for HPV vaccine in 2013. 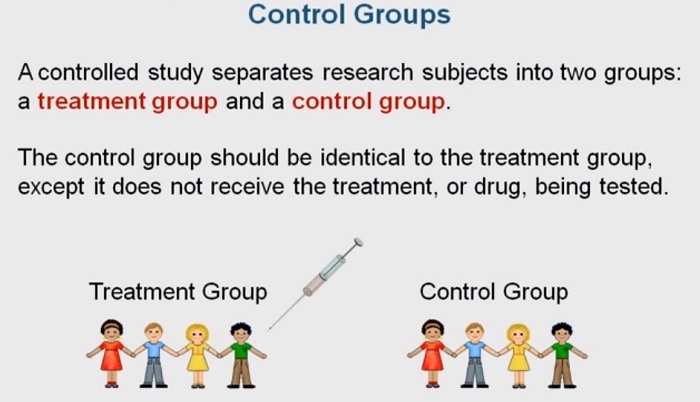 It just makes sense that if you want to learn the effects of a particular drug or vaccine, you would compare what happens in a group of people exposed to it, versus what happens in a group not exposed to it. This is the cornerstone of sound scientific methodology and it is used to ensure that research results are valid and reliable. In science, valid means you’re measuring what you think you’re measuring and reliable means you get the same results in multiple trials. The scientific method requires that credible research is both valid and reliable. The first two charts below illustrate how scientist achieve validity and reliability by using a placebo-controlled research design. 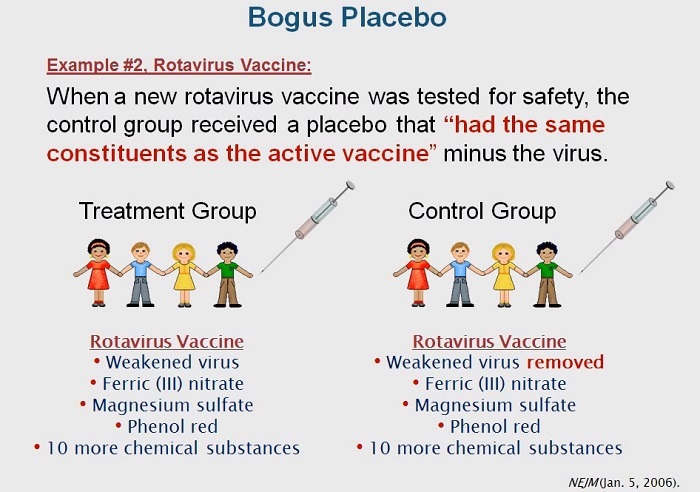 The illustrations below document two examples of actual clinical vaccine trials. Vaccine trials are very often conducted using flawed research designs, whereby there is no true placebo. 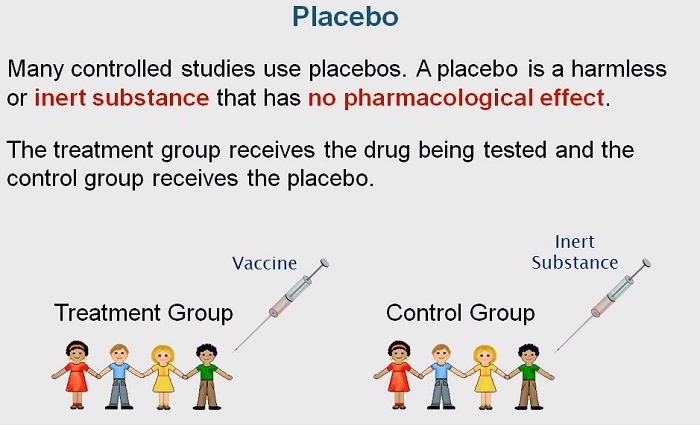 In these trials, instead of the control group receiving a harmless placebo, they receive everything in the vaccine except for the active ingredient. That means they are injected with some or all of the same chemicals and byproducts present in the vaccine, minus the virus itself. By doing this, researchers deliberately skew the results in favor of safety. There is never a way to compare outcomes between those who receive the vaccine and those who do not. 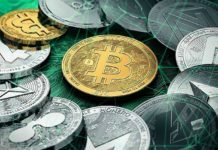 In fact, they have to go to some level of trouble and expense to distort the process in this way, but it reaps dividends for them by helping them avoid gathering data which would be hard to explain or justify. 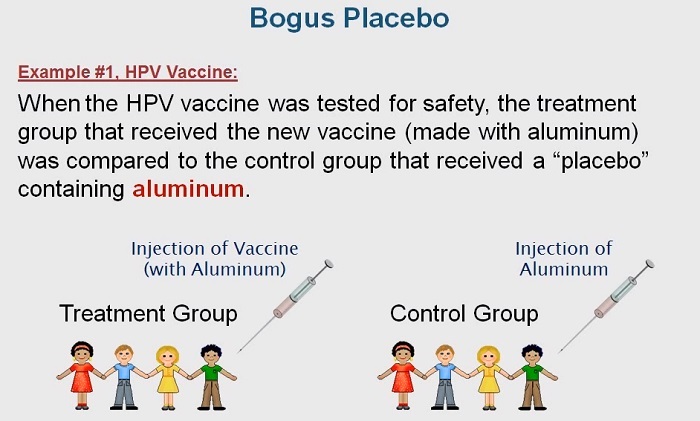 In other words, maybe the virus they’re injecting could be safe, but the aluminum, for example, is not. If this were the case, this kind of flawed research would never reveal it. When we see how vaccines are tested, and the utter lack of important testing, it’s really not surprising that there are so many VAERS reports on vaccines. As the examples above demonstrate, clinical vaccine trials are actually designed to avoid gathering data that would yield information about overall safety of the product. This fact, in and of itself, should be cause for sincere concern. It is clear that drug makers actively avoid learning of adverse effects, rather than strive to discover and remedy them. The utter lack of true placebo-controlled vaccine trials is a glaring problem and it reflects a deliberate choice on the part of regulatory agencies and drug companies to look the other way when it comes to vaccine safety. It smacks of collusion among these entities and shows an utter disregard for those they would mandate be vaccinated. Anyone citing clinical vaccine trials that were conducted in this manner as the basis for their argument for vaccine safety or effectiveness is either naive or deceptive; they are either the dupers or the duped. Flawed research in vaccine clinical trials yields data that is neither valid nor reliable and this is at the heart of the trust issue, particularly among skeptics who are schooled in the sciences. The answer to this question is: we don’t know. We know that most vaccines produce antigens for some people but we have no conclusive evidence on how that really translates into immunity. If we believe the medical journals, vaccines have varied efficacy rates. However, we have MANY (too many to fit in this article) documented cases that prove that vaccines were not effective, and it is reasonable to suspect there are many others that we don’t know about. These cases not only challenge the effectiveness of vaccines, they also show that vaccine acquired herd immunity is not a viable theory. In a study published in the British Journal of Medicine, researchers found that influenza vaccines have had little or no effect on reducing the incidence of influenza. 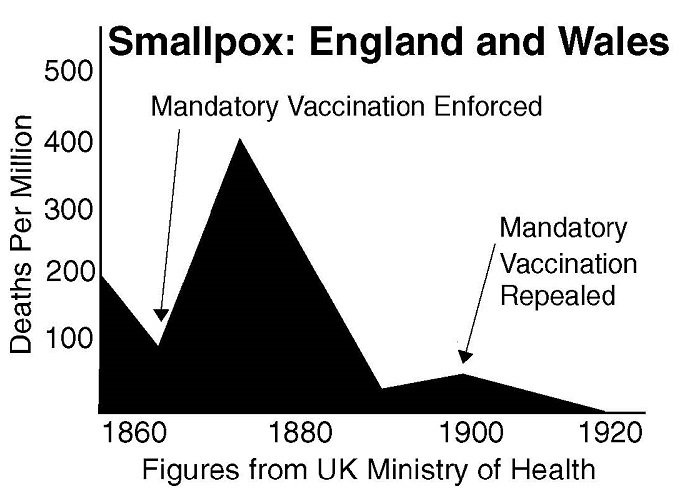 When we look at the historical graphs and see where vaccines were introduced in relation to disease down-trends, it is really difficult to identify vaccines as the cause. It seems much more likely that improvements in sanitation accounted for the decline. 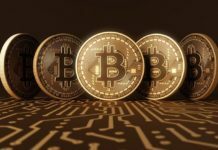 We go into further detail about this topic later in this article and in greater depth in Part 8 of this series. For years, China has experienced measles outbreaks despite the fact that 99% of the population has been vaccinated. In 2014 there was a well- documented flu outbreak aboard a US Navy minesweeper, among a highly vaccinated population. The FDA released a notice in 2013 reporting that the pertussis vaccine did not prevent pertussis, noting outbreaks among the fully vaccinated: “There were 48,000 cases reported last year despite high rates of vaccination,” said Anthony S. Fauci, M.D., director of the NIH’s National Institute of Allergy and Infectious Diseases. These are just a handful of examples that point to major problems with vaccine effectiveness. Here is another article that further calls into question the effectiveness of vaccines. 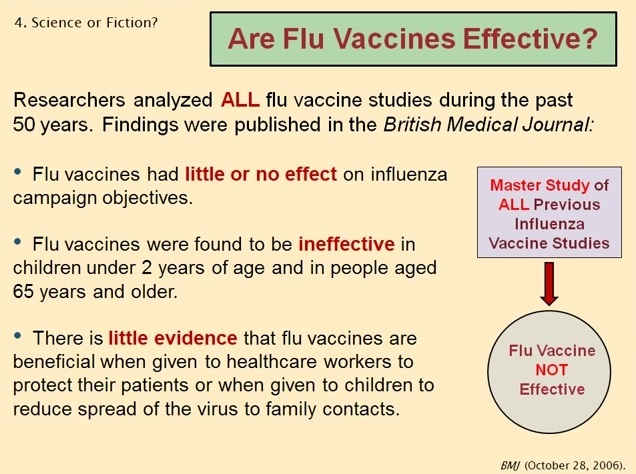 A February, 2015, NBC article titled, Flu Vaccine Doesn’t Work in Europe, goes into some detail about the effectiveness of the influenza vaccine. The article notes that the flu vaccine was almost completely ineffective last year against the flu that was present in Europe and the U.S., protecting only about 3 percent of those vaccinated, as estimated by British health officials. According to this article, U.S. health officials said the flu vaccine reduced disease risk by 23 percent. In fact, a study published in the journal Eurosurveillance in February, 2015, found that the overall vaccine effectiveness in preventing influenza was 3.4 percent. A spokesperson for Hutchinson Schools took it further, noting that every case he had seen was in a vaccinated child. A July, 2015 article published in The Vaccine Reaction, Pertussis in Reno County: Another Outbreak Among the Vaccinated?, explains that most of the people contracting pertussis in outbreaks across the country have been fully vaccinated. In 2012, Reuters published an article about a study published in the Clinical Infectious Diseases journal. In looking at 132 patients who tested positive for pertussis, the researchers discovered that 81% of them had received all of the recommended pertussis vaccines and boosters and 11% had received at least one round of the vaccine. In 2012, there was a major outbreak of pertussis in Vermont. As of August 10 of that year, public health officials had determined that 90% of 178 infected children in the state between the ages of six months and 18 years old had received at least one dose of the pertussis vaccine, and that about 80% of them had gotten 5-6 doses. Based on what we know and on what even the CDC has admitted, the pertussis vaccine cannot be considered effective. Here is another article about a pertussis outbreak in Park City Utah: 19 confirmed cases of pertussis and all 19 were vaccinated. Dr. Hadwen was a brilliant man and an acclaimed scholar who wrote his first article on the topic of vaccines in 1923, titled The Fraud of Vaccination. He was an outspoken proponent of researching matters for oneself, rather than following the herd or trusting common wisdom. His research led him to consider traditional medicine’s stance on vaccines “a grotesque superstition”. Dr. Hadwen pointed out the fact that vaccines often killed more people than the disease they were designed to prevent. 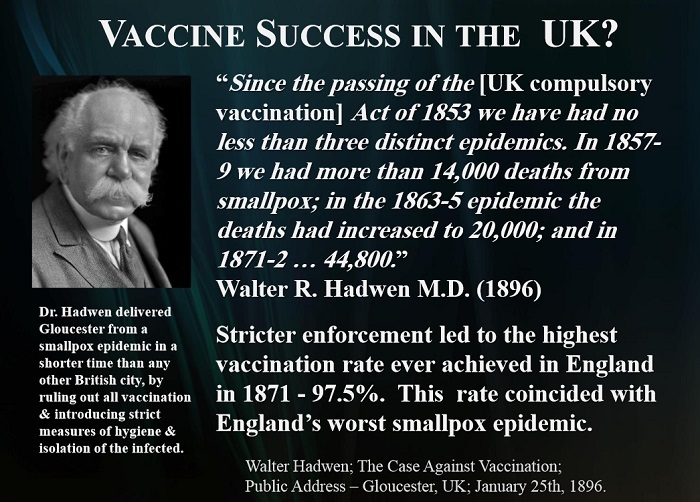 Dr. Hadwen became famous for shepherding the city of Gloucester, England, through a smallpox epidemic in a shorter time than any other. He accomplished this by favoring hygiene and isolation of the infected, over vaccination. 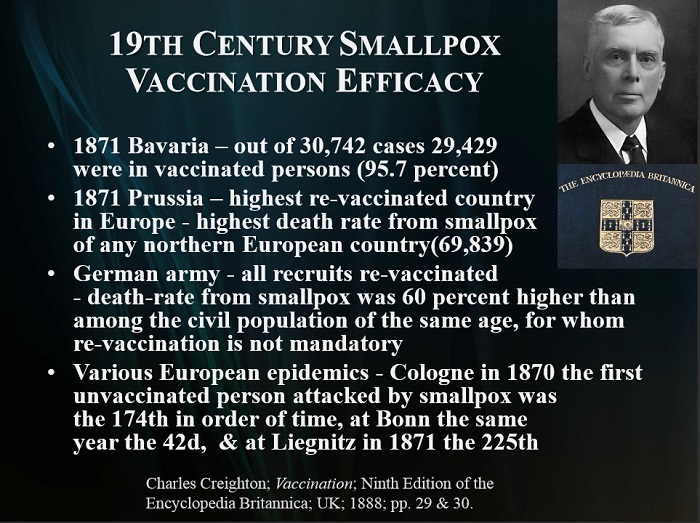 This is only an introduction to the pioneering skeptics in the field and their research showing that vaccines never were the highly effective disease preventatives advertised. As you can see in part 8 of this series, there is compelling evidence showing that vaccines did not eradicate diseases in the 20th century like we were all told. As we can clearly see, vaccines have been proven to be neither safe nor effective, as we are so often told. What is most troubling is that so many of us have no idea about VAERS or the Vaccine Injury Compensation Program because doctors don’t typically tell parents the real risks of vaccination. To do so would risk diminishing vaccine uptake and that would be a blow to everyone who is invested, literally and figuratively, in the pharmaceutical industry. If people know the facts about vaccine injury, more and more will opt out. If we’re looking at what the authorities are sharing with us about the risks and benefits of vaccines, we can in no way consider the consent we give to be informed consent. Let’s look at this another way: What other product would you buy and put in your children’s bodies, knowing that the manufacturer had conducted no long term safety studies? Outside of vaccines, what other chemical cocktails would you happily ingest or inject, based solely on the advice of authorities, all of whom stand to profit from their sale? Consider an example that’s even more benign than injected viruses and chemicals: Would you buy a particular model of car if research showed that 30%-40% of the time, it might result in some kind of adverse effect, injury or even death? Would it matter that the manufacturer had sold that model for decades? If they had the slickest ad campaign in the world? If 5 out 5 salespeople recommended it? Would you want to see the data? What if the only data they could show you had been manipulated to hide results that could hurt sales? Oh, and by the way, the car may not even work. I certainly realize that a vaccine and a car are different in many ways, but they are both products from businesses. Somehow, we live in a reality in which the cars we drive are more stringently tested than the vaccines we inject. Car companies have some accountability for their products while drug manufacturers have no such motivation to create safe and effective vaccine products. So at the end of the day, parents are forced to play a game of vaccine roulette with their children’s safety, because we really don’t have the data we need in order to know which children are at risk for which injury at which developmental stage or at what age. We are so bereft of data, we don’t even know the scope of what we don’t know. In the absence of valid and reliable data, we have not yet begun to identify the various factors that mitigate vaccine safety or effectiveness. Part 10:Why Don’t We Hear The Whole Story About Vaccines? 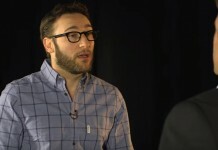 Speed the Shift is an independent group of researchers on a mission to find the truth about controversial topics. We utilize alternative information sources which is often ignored by traditional media in an effort to gain broader awareness on relevant issues.